Due to their nature, certain charsets (for example Chinese and Japanese) may clash with how certain internal components of Zephyr work. Although we can fix them on the fly to some extents, some of the external third libraries we use do not support these charsets. 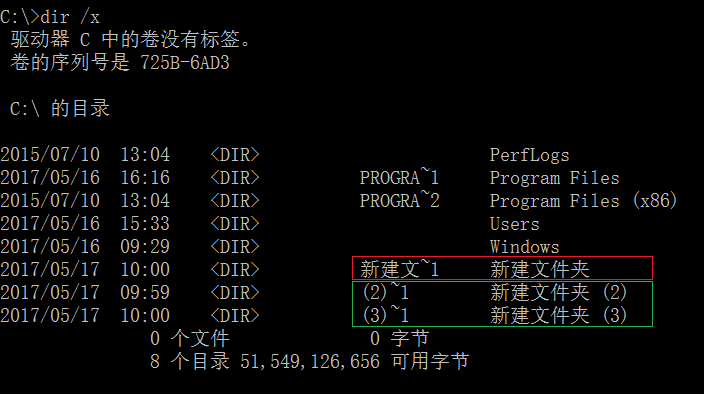 If you are running an operating system with one of this extended charsets (for example Windows 10 Home Chinese Edition) you may encounter some issues. First of all, ensure that 8dot3 naming system is enabled. This should be true in all default installations, but if you are using external drives this might not be the case. Once again, using fsutil, if your drive is set to use the extended charset, you may have to turn it off. We suggest you save your dataset on an external drive, so that you don’t have to turn this feature off on your main hard drive (where the operating system is installed). You can use the command dir /x to check and confirm if the target directory has been generated with the extended charset on or off. In the above example, you can see the directory highlighted in red with the extended charset on (which will cause problems in zephyr) and highlighted in green those created after the extended charset has been switched off. then press enter. At this point, you must reboot your computer. This operation can take a long time.